Appeal for information: Where is this? Posted on February 29, 2008 March 1, 2008 Author CromptonCategories CiA, Crompton2 Comments on Appeal for information: Where is this? First scalp to an urban ethic? The British Government’s decision to unceremoniously ditch the Blairite supercasino dumped on east Manchester gives one hope that substantial policies of urban regeneration might be expected. Ok, we might now be seeing the nationalisation of a bank and a downward slide in domestic property market speculation, but allow us a sly smile at the evaporation of another example of glazed junkspace. The advance of the scavenger economy has been at least temporarily halted, leaving the Thomas Heatherwick designed ‘B of the Bang’ looking preposterously forlorn as well as insecurely constructed. When the city fathers recover from this public relations disaster can we hope that they might, at last, become admirers of Prudence? Posted on February 28, 2008 Author AventinusCategories Aventinus, CiA, Manchester1 Comment on First scalp to an urban ethic? Continuity in Architecture recommend an exhibition that celebrates the work of the 16th century artist, Matthias Grünewald. The centrepiece is the Isenheim Altarpiece, a work of art that is still both startling and terrifying almost 500 years after its creation. The exhibition continues at the Unterlinden Museum in Colmar, France until March 2nd. See also ‘Books by us’ in the side bar. Sesquipedalist has had the brilliant idea of publishing The Honeywood File, a novel consisting of the letters found in the job file of fictional 1920s architect James Spinlove, in blog form. The story starts HERE. Well I think it’s funny. 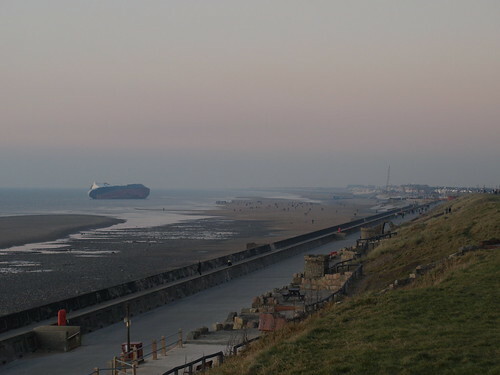 The small seaside resort of Cleveleys, north of Blackpool, receives the economic benefits of a shipwreck. Continuity in Architecture Year 5 students continue to explore projects in Milan. Here are two films, by Tom Keeler and Nick Walkley which take very different routes to exploring a context. 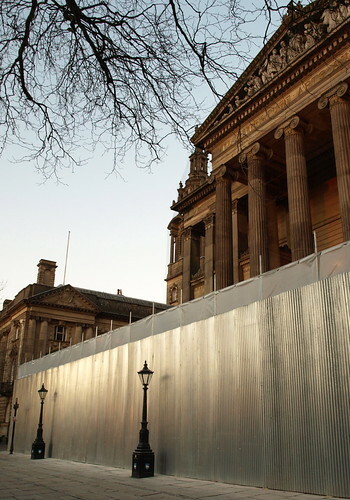 Elegant temporary wrapping at the Harris Museum, Preston. The lodge or folly in the grounds of a great building is often more likeable than the main event. 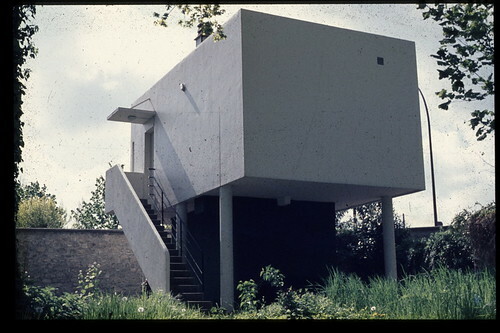 This structure is just inside the entrance to the grounds of the Villa Savoie. High up on Africa House, Holborn, are armed Superheroes with elephants crocodiles and a camel, Jumanji on the roof one might say. If an African vignette was carved today what would it look like? Continuity in Architecture are pleased to announce the recent publication of the paper “The Dome of the Rock: Origin of its Octagonal Plan” by our former colleague Dr. Anwarul Islam (and Zaid F. Al- Hamad). Published in Palestine Exploration Quarterly the paper has been described by the Islamic Art and Architecture authority Professor Emeritus Oleg Grabar of Princeton University as presenting ‘a very cogent and intelligent statement’ on the building’s origins. The paper is published in PEQ 139, 2 (2007), pages 109-128, and is produced by the Palestine Exploration Fund, founded in London in 1865. Something for transport/concrete enthusiasts: a set of discarded slides of Preston Bus Station during construction and soon after. The building is of course “about to be demolished” – perhaps the architects (BDP Preston) expected a forty year lifespan? What an extraordinary building though, photographed with extras borrowed from Get Carter. Thanks to Richard Brook for the tip-off.